That brings us to the matter of the “many nations” that Ezekiel said would be involved in the destruction of Tyre. The literary organization of the prophecy (quoted above) seems rather simple. It began with an introductory statement of what Yahweh intended to do to Tyre. He said that he would (1) cause “many nations” to come against it, (2) destroy its walls, (3) break down its towers, (4) scrape the dust from it and make it like a bare rock, and (5) slay its “daughter villages” in the field. 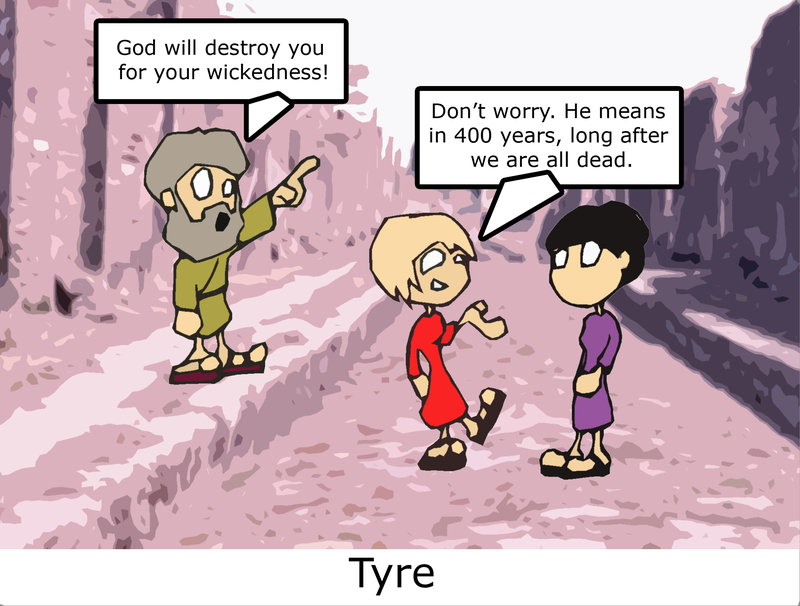 After describing in general terms what he was going to do to Tyre, Yahweh then proceeded to state the specifics of how this would be done: “For thus says the Lord GOD: I will bring against Tyre from the north King Nebuchadrezzar of Babylon….” It seems rather clear, then, that Yahweh was saying that Nebuchadnezzar would be the instrument that he would use to destroy Tyre as promised in the introductory statement, so he proceeded to state the specifics of what Nebuchadnezzar would do to Tyre. He would put Tyre’s daughter-towns in the country [the mainland villages] to the sword, he would set up a siege wall, he would cast up a ramp, etc., etc., etc. The prophecy listed a dozen specific military actions that “he” would direct against Tyre, and the only reasonable antecedent of the pronoun he is Nebuchadnezzar. Literally, then, when the armies of Nebuchadnezzar or Cyrus or Alexander attacked a city or territory, it wasn’t just the aggression of a single nation but of many nations. This reality of ancient warfare was reflected in a familiar scenario in the Old Testament in which biblical prophets and writers depicted battles against common enemies as the gathering of “many nations.” In 2 Chronicles 20:1-4, this allegedly happened when Jehoshaphat was king of Judah. When inerrantists today look at Ezekiel’s prophecy through the glasses of historical records, they can clearly see that it was not fulfilled by Nebuchadnezzar, and so they must look for some way to explain away the failure. Ezekiel’s reference to “many nations” is a straw that some inerrantists like Brad Bromling have grabbed to try to salvage the prophecy, and so they have tried to make the prophecy mean that a series of attacks by many different nations spread out over 1900 years would result in the eventual destruction but that Ezekiel never meant that the total desolation of Tyre would be caused by Nebuchadnezzar. However, the literary organization of the prophetic passage (which I analyzed above) and the facts just noted about the multi-national composition of ancient armies like Nebuchadnezzar’s make this “explanation” questionable to say the least. It is more likely that Ezekiel meant that “many nations” under the leadership of Nebuchadnezzar would bring about the total destruction of Tyre. This entry was posted in Bible, Prophecy, Theology. Bookmark the permalink. Thank you for the post, Christopher. I’m a big admirer of the late Farrell Till’s razor sharp intellect, wits, and erudition. Unfortunately, his work is fast disappearing from the Internet as his website and blogs are no longer “live” (the link that you provided being an example). Google searches often lead to “archived” pages or sometimes to nothing. Do you know if there’s an effort to preserve his online writings? That would be noble and useful. Thank you. That is a sad state of affairs. I am glad I caught the most material points before it disappeared. It looks like you are right in that only archived internet pages show for this work of his. Sorry I couldn’t be of more help.